I remade Rachael Ray’s FreshOver Recipe for Greek Grilled Chicken & Vegetable Salad for my family. We all love Greek flavors like olives and feta. I knew the kids would love it because the chicken and salad is served in pita bread. It’s a really fun way to get your kids to eat healthy salad and vegetables. 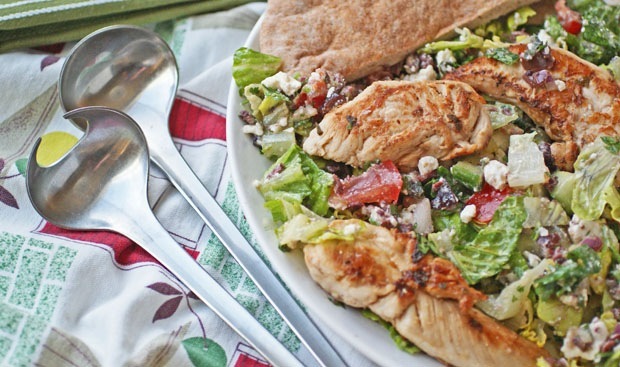 Plus, if you can find whole wheat pitas and reduced fat feta, even better! With school and afterschool activities, sometimes we don’t get home until dinner time. While this recipe doesn’t take much time to put together once your prep is done, the prep itself is a bit extensive – lots of chopping and measuring. So I got everything ready the day before by making the dressing and chopping the vegetables and herbs, and storing them in Ziploc Brand Twist ’n Loc Containers. These containers also came in handy to bring leftovers to school and work. You can save additional time by buying already chopped lettuce and crumbled feta cheese, instead of block feta cheese. Preheat grill pan over high heat. Place chicken in shallow dish and season with salt and pepper. Preheat oven to 275 degrees F. Wrap pita breads in foil. Place in warm oven and heat until dinner is served. Combine lemon zest, juice and vinegar in a bowl and whisk in oil. Add oregano, garlic and whisk again to combine into dressing. Pour half the dressing over chicken tenders. Turn tenders in dressing to coat. Combine remaining salad ingredients in a bowl. Pour remaining dressing over salad and toss well. The salad should be very lightly dressed. Season salad with salt and pepper and transfer to a large serving platter. Grill tenders 4 to 5 minutes on each side. Transfer hot tenders to the salad lined serving platter. Remove pitas from oven and unwrap. Cut pitas in half and arrange around the edge of platter. 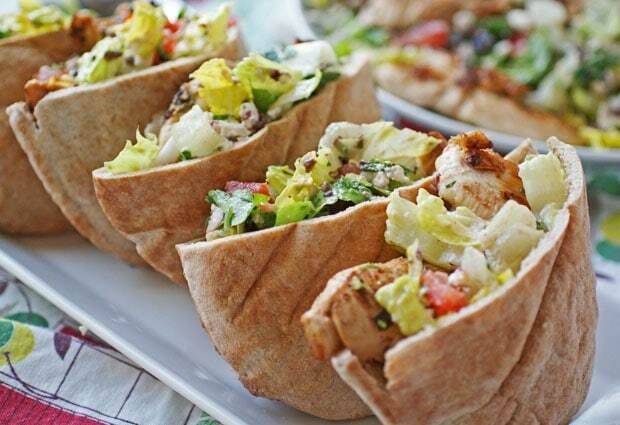 To serve, each person can pile grilled chicken and veggies into pita halves, wrap up on either side and enjoy! Posted in Recipes and tagged chicken, salad recipes on February 2, 2012 by Anne-Marie Nichols.